Ever since the Sewol ferry incident occurred in April, President Park Geun-hae has been subject to heavy criticism and rumors for her poor handling of the situation. In response, the president decided to take active measures by pledging to crack down on the citizens responsible for circulating the rumors and insults against her. Kakao Talk, a smartphone messaging application used by 35 million of the country’s 50 million people, is one of her primary targets. 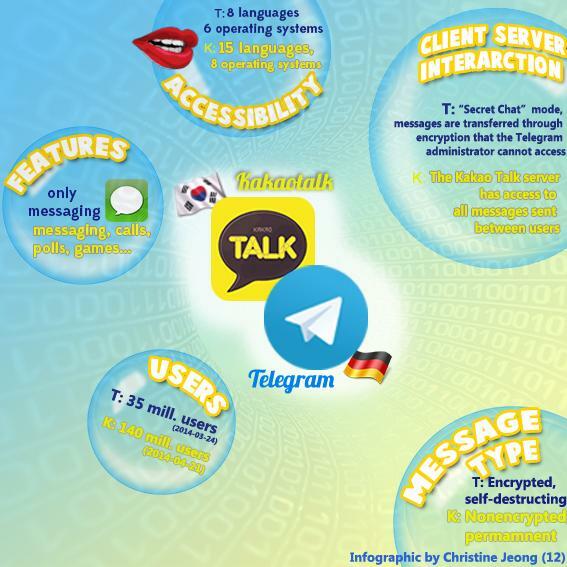 Users of Kakao Talk responded immediately to this announcement of government crackdown by leaving the application en masse for an increasingly popular German message application called Telegram. Since Oct. 1, Kakao Talk has lost 400,000 South Korean users, with Telegram gaining 610,000 South Korean users as a result. One of the main reasons South Korean users turn to Telegram is for its high level of security. Earlier this year, the two founders of Telegram, Nikolai and Pavel Durov, offered $200,000 to anyone who could hack into the system, a challenge that nobody was able to complete. According to Wall Street Journal, this high level of security can be attributed to its well-encrypted message platform. In order to meet up to the complaints regarding security, Daum Kakao announced this week that it would store chat-history data no longer than three days instead of the previous seven. The company also said that it would fully encrypt its messaging platform and introduce a privacy mode that deletes messages after they’ve been read. Previous ArticleTTONL TV: Are the “Tiger Value Awards” effective?